Jean Guillou, posed at the pipe organ of the Saint-Eustache Church in Paris, saw it as his life’s mission to emancipate the organ from the bonds of the church, his biographer said. Jean Guillou, a French organ master whose modern-sounding compositions, unusual transcriptions, and idiosyncratic performances challenged centuries of tradition and were preserved on more than 100 recordings, died Saturday in Paris. He was 88. His death was announced by his music publisher, Schott Music. 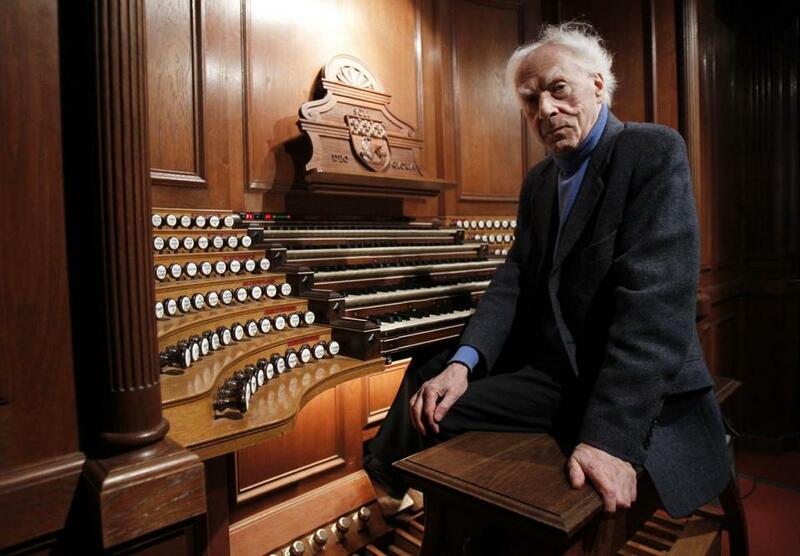 Mr. Guillou never lost the capacity to shock in a career of nearly eight decades, from his beginnings as a church organist while still a child through the half-century he spent in one of the most important organ posts in France, at the church of St. Eustache in Paris. He bucked performance traditions; transcribed music by composers who could seem an odd fit for the organ (including Stravinsky, who had dismissed the organ by saying that “the monster never breathes”); wrote ambitious organ works in his own idiom; and helped design new organs that challenged conceptions of how the instrument should look and sound. “Guillou proved that organists need not follow the orthodox path,” wrote Cameron Carpenter, a young American organ star with a punkish demeanor and unorthodox approach of his own, in an e-mail. Critics, and other organists, sometimes harrumphed at the interpretive liberties and flights of fancy that Mr. Guillou took in a time in which the trend, especially in early music, was toward historical fidelity. But his flamboyant style was a revelation to many. Michael Barone, host of Pipedreams, the American Public Media radio program about the organ, recalled that Riverside performance as thrilling. Although Mr. Guillou passed much of his life playing in churches, he also saw it as his life’s mission to “emancipate this instrument from the bonds of the church” and make it part of the larger music world, said his biographer, Jörg Abbing, in an e-mail. And his own compositions were often daring — including “La Révolte des Orgues,” scored for nine organs and percussion, which became something of a cult organ piece, and “Alice in Organ Land,” for organist and narrator. Organist Paul Jacobs, who is chairman of the organ department at Juilliard and has played Mr. Guillou’s works, said that despite his reputation as an enfant terrible, Mr. Guillou exhibited great refinement in his music. Jean Victor Arthur Guillou was born in Angers, France, on April 18, 1930, to Victor and Marguerite Guillou. His father was a natural gas salesman. Jean was pressed into service playing the organ at a local church before he was even a teenager. He studied at the Paris Conservatoire with Marcel Dupré, Maurice Duruflé, and Olivier Messiaen, spent time in Lisbon and Berlin, and was appointed organist at St. Eustache in 1963. He leaves his wife, Suzanne, a professor and writer, and a daughter, Béryl Zuccarelli, said Giampiero Del Nero, president of Augure, an association devoted to Mr. Guillou’s work. Mr. Guillou was always thinking about ways to modernize the organ. His designs were incorporated into new instruments around the world, including one shaped like a giant hand at a church in L’Alpe d’Huez, France, and another (now being replaced) that was used for nearly three decades at the Tonhalle concert hall in Zurich. His book “The Organ, Remembrance and Future” (2010) traces centuries of organ history while making the case that organists should not be hampered by tradition. Mr. Guillou recorded for the Philips, Decca, and Dorian labels among others. His recordings preserve many of his performances of Bach, Liszt, Schumann, Brahms, and his own compositions, and he appeared as the soloist in a recording of Saint-Saëns’ Symphony No. 3, the “Organ Symphony,” with the San Francisco Symphony.